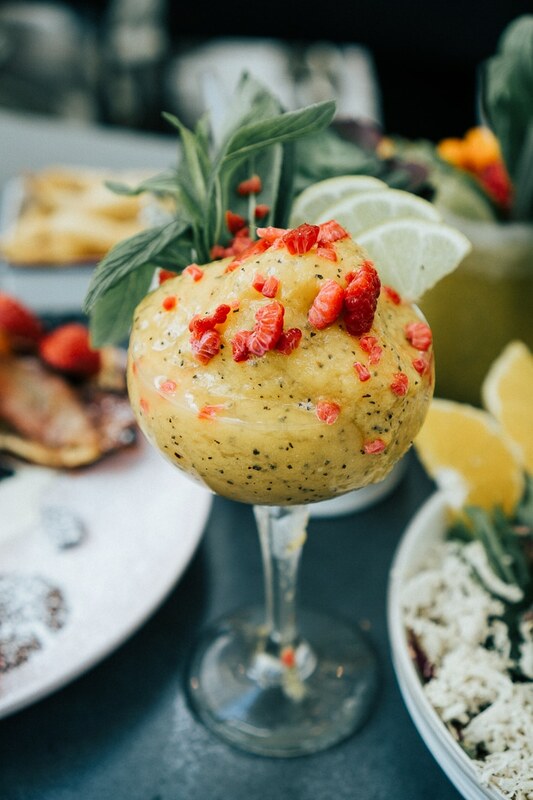 Sydney Brunch is an absolute must! The Australian city is filled with amazing spots to enjoy the delicious meal, here are 8 of my favorites! 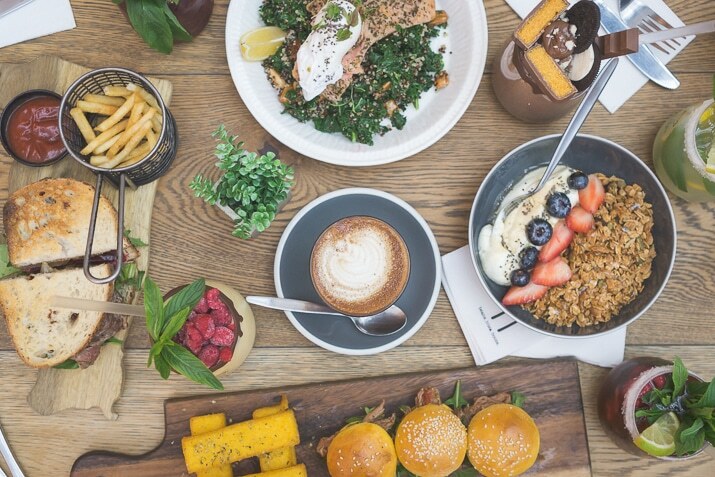 Sydney Brunch may quite possibly be the best brunch. I love brunch, I think it might be my favorite, in fact, I know it is. I’m not a morning person, so a meal where I can roll out of bed at 9:00 am and be sipping mimosas and mochas simultaneously by 10:00 am is the ultimate morning routine, in my opinion. I think the other reason I love brunch so much is that the menus seem to offer everything from breakfast to lunch to dessert. 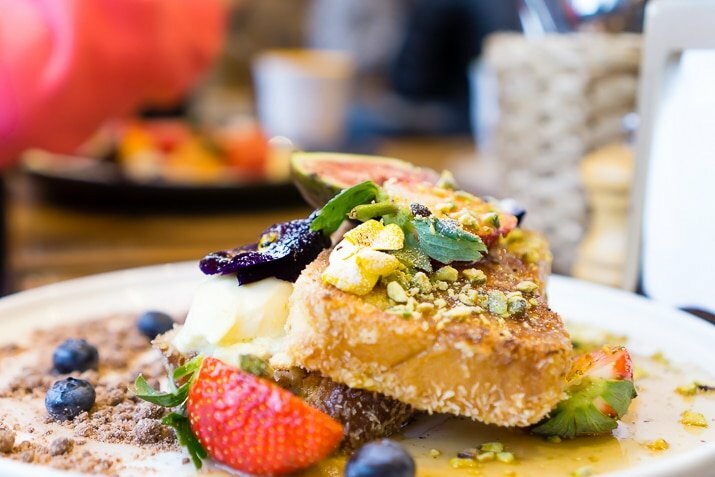 Sydney Brunch is definitely over the top, but it all the right ways. It’s delicious and pretty and fun and did I mention delicious? 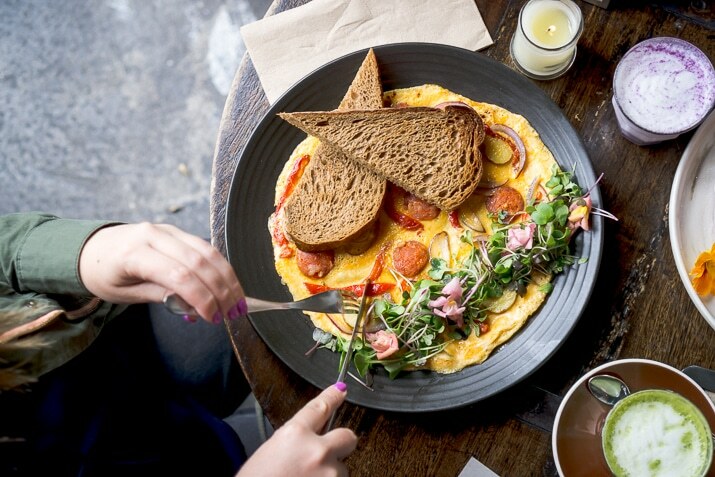 Sweet or savory, it doesn’t matter, most places in Sydney are going to serve you some gorgeous and tasty dishes when it comes brunch time. 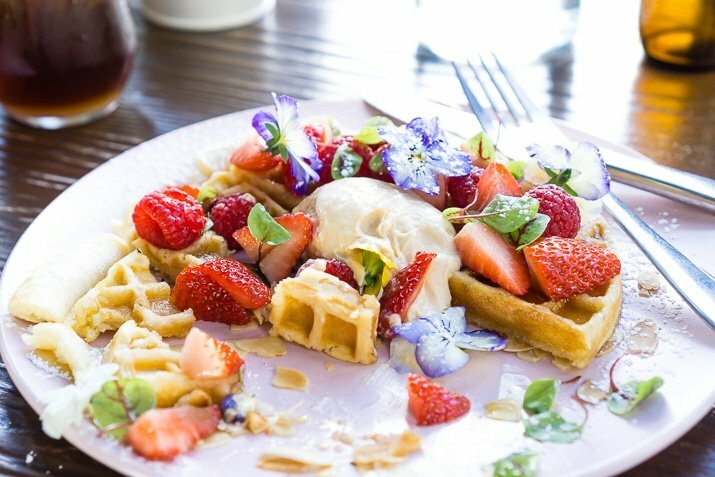 I also loved that brunch was an everyday thing in most cases, no longer restricted to curing Saturday’s hangover, Sydney Brunch could be enjoyed on a Wednesday by those who seek it. When I was there a couple of months ago we sought out many and I wanted to share my favorite spots with you in case you’re planning a trip too and want to try some of these amazing dishes yourself! 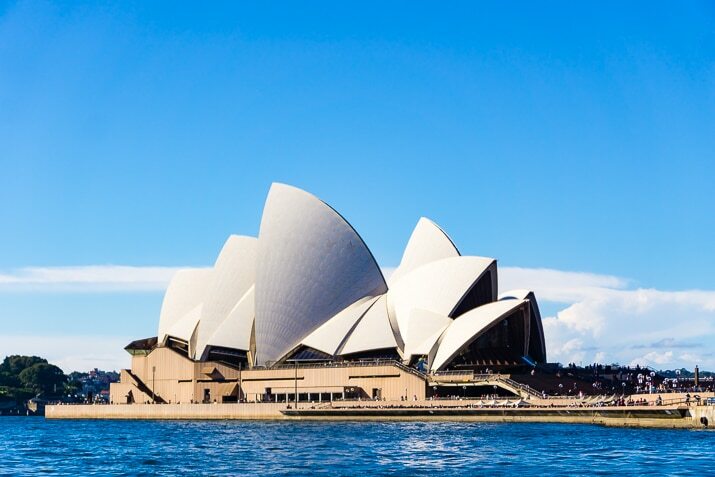 Sydney is a massive city and we covered a lot of ground in our time there, so you’ll see the suburb name after each restaurant name as well as the map below to help you plan your trip. This place is such a treat. We got there a little late in the morning and weren’t able to get a table with one of the really amazing harbor views, but it was still pretty great. 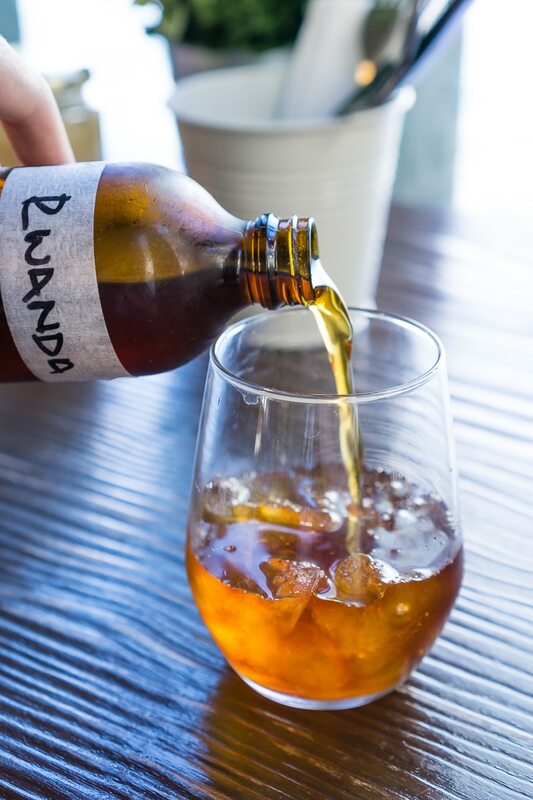 The cafe is located on the ferry wharf in Kirribilli and is really easy to get to from South Sydney by ferry or an easy 10-minute walk from Milson’s Point and the train stop. I enjoyed a cold brew coffee and their Celcius Waffle that was loaded with fruit, toasted nuts, maple syrup and peanut butter cream. 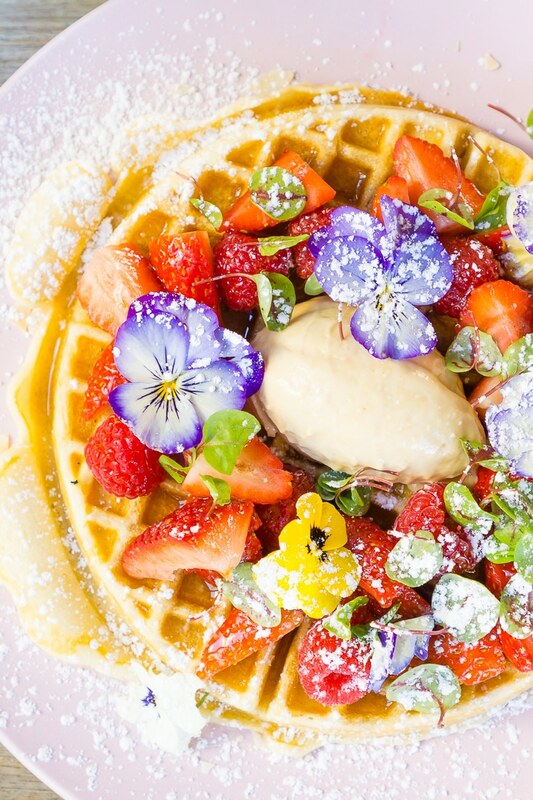 It’s served with edible flowers which make it one of the prettiest brunch dishes I’ve ever eaten. And the peanut butter cream was to die for! My friend, Rachael, got the toasted fruit loaf and the Bondi pressed juice. You can’t spend the morning surfing unless you fill up on some of the wholesome brunch options at Speedo’s Cafe! 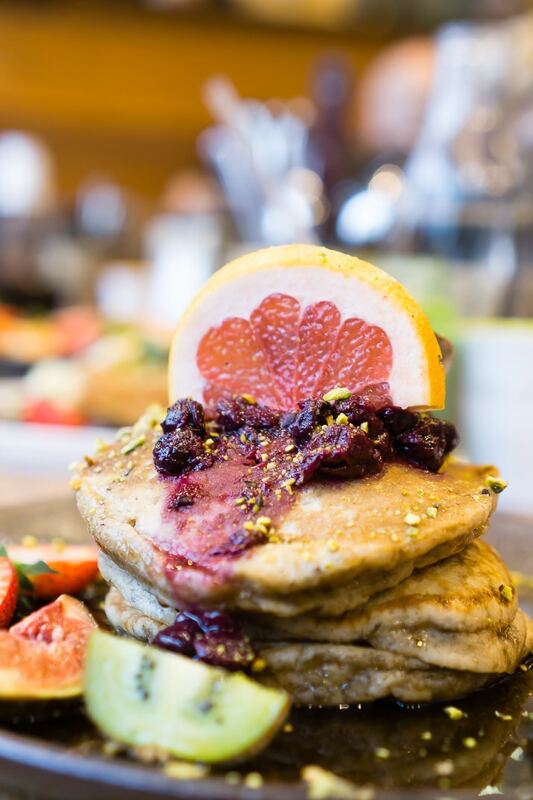 Here’s you’ll find tons of gluten free and vegan brunch dishes. I will say this was one of the pricier brunch places we went to, but I really enjoyed my plate of triple stack berry banana pancakes. I think my favorite thing that we tried though, was the cinnamon rolls… SO GOOD! This place was off the hook, their dessert cocktails were downright amazing! I can’t recall the name of mine but it had Irish Cream in it and it was just like drinking a boozy dessert! We also had the frozen Nutella cocktail and that was a mighty fine drink as well! Their fruit cocktails don’t disappoint either, I got the one in the picture below to start the day with, it had passion fruit in it and lots of other fruity liquid goodness. We had a variety of dishes, I had the Sliding Balls and they were really good. The burgers and ribs brought smiles around the table and the Citrus with Interest was a great lighter fare option. This place is a little tricky to find. It’s part of the Macquarie Park Shopping Centre, but it’s actually outside of the mall itself. The best way to find it is to actually walk along Waterloo Rd and not go through the mall, if you’re on the sidewalk, you can’t miss it! Hattrick is the youngest sister of The Vogue Cafe and The Missing Piece (which we’ll get to). The Vogue Cafe is inside the Macquarie Park Shopping Centre and is probably the best of the locations for kids. The kids will love the fun kid-friendly mixed drinks and smoothies and they serve breakfast ALL DAY! Vogue serves up a specialty drink every week as well as some specials dishes, so make sure you check out the specials menu, I definitely think it has some of the best stuff they offer! The granola bowl is a great light option and their burger is fantastic! 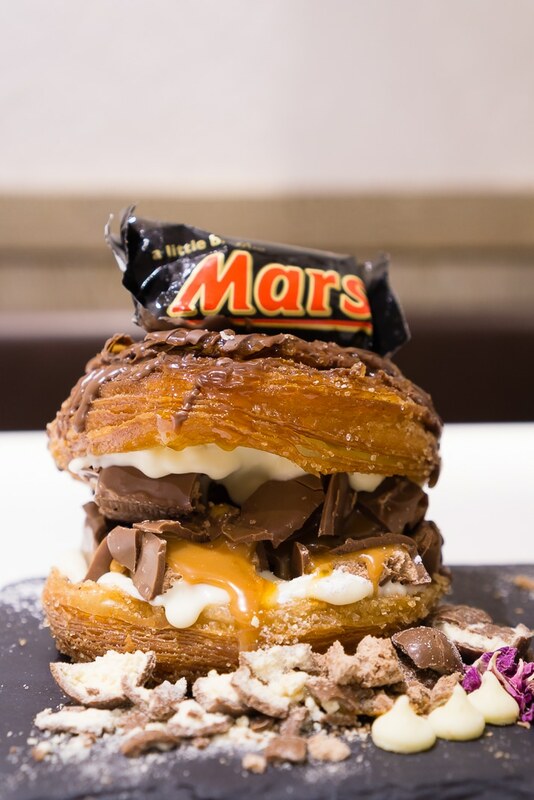 And you can’t leave without getting one of their over-the-top CRONUTS! This place is hipster-charming and they have a unique menu that ranges from super sweet to super healthy. If you’re going here and you have a sweet tooth, you HAVE to get the Red Velvet Pancakes, if you want something more along the savory side of things, I would highly recommend the Spanish Omelet. 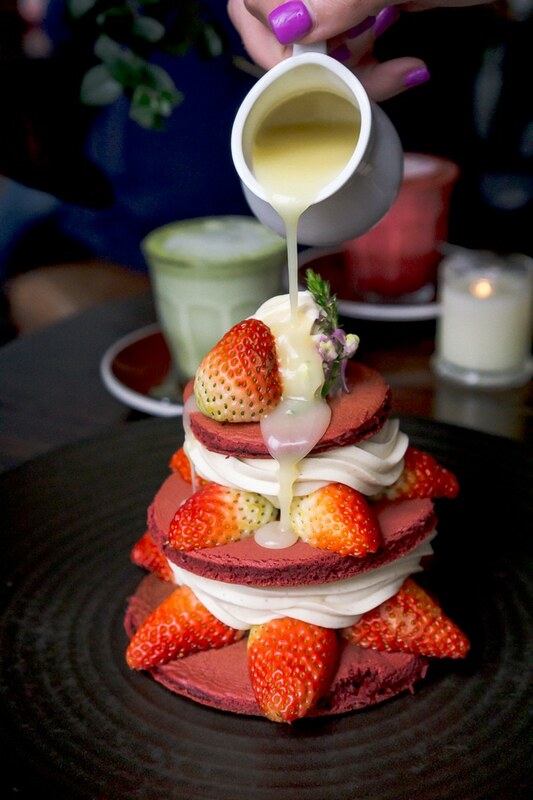 They also serve up Taro, Red Velvet, and Matcha lattes, we’d recommend skipping the Matcha as it was pretty chalky but the other two were really delicious (but sweet). They also serve halal meat with their dishes. Yes, maybe it’s a bit overdone, but I don’t care, as a pancake lover, I HAD to go! 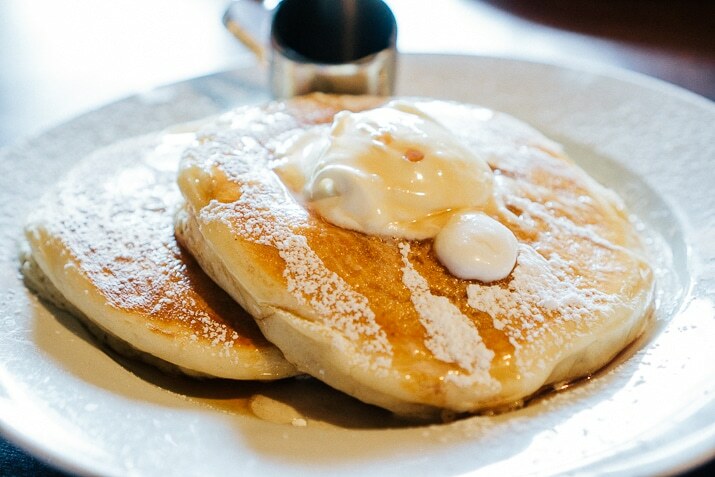 And this Sydney Brunch spot did not disappoint like these pancakes were some of the best I’ve ever had. This place is known for their over the top pancakes and the chocolate pancakes are dynamite, but for me, the short stack of traditional pancakes hit the spot. This place is also open 24-hours a day! So this place opens at 11:30, so it’s more like a breakfast for dessert spot, but it’s worth it. 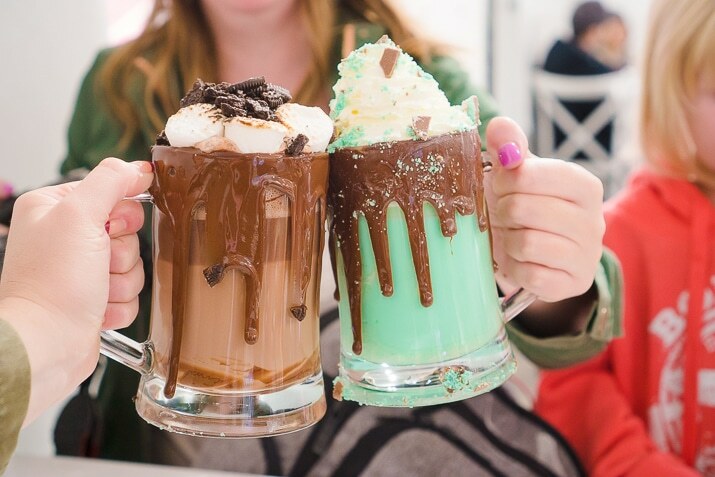 The hot chocolates are huge, so you might want to split one and the Honeybread is something really special and a unique dish you won’t find anywhere else. 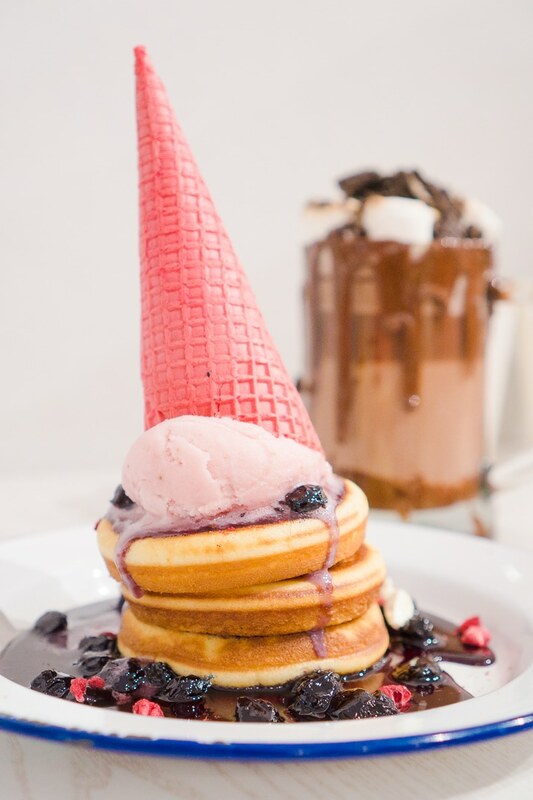 Even if you’re not staying in Chatswood, the restaurant is in the multi-level shopping center right next to the train platform, so it’s an easy stop if you just want to pop up for a bite to eat! 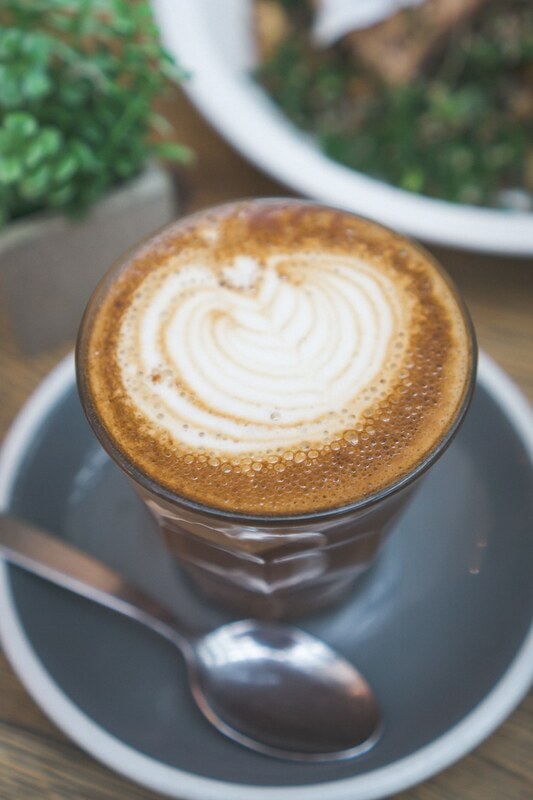 This Sydney Brunch place claims to have the best mocha in the world, and I must say, I think I’d have to agree. I’m not normally a huge fan of mocha lattes, but this cup of steamy, frothy, chocolate and coffee was divine! I got the Hashtag Sliders because I couldn’t resist trying a lamb slider and they were pretty tasty, served up with fried polenta (another favorite), and jalapeño mayo. 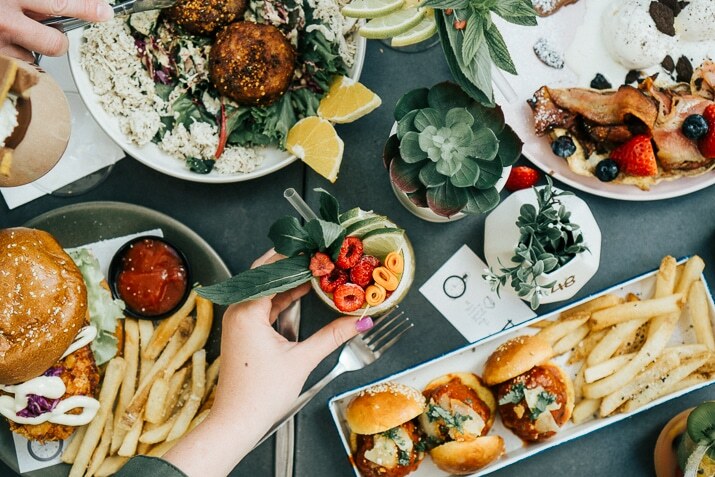 This cafe is sort of like an open-air dining experience in The Macquarie Park Shopping Centre, it’s a lively place and we had so much fun dining here (even if people were making fun of us for standing on stools to get flat lays of the table – it’s my job, people). So there you have it, my favorite 8 spots that we enjoyed brunch at during our time in Sydney, Australia? Are there others you would recommend? There were certainly more on our list that we didn’t get a chance to try! Leave more recommendations in the comments! Sydney sure knows how to do brunch!